(Nanowerk News) A multidisciplinary team of University of Cincinnati (UC) researchers is the first to find an innovative and novel way to control an electron's spin orientation using purely electrical means. Their findings were recently published in the prestigious, high-profile journal Nature Nanotechnology, in an article titled "All-Electric Quantum Point Contact Spin-Polarizer." For decades, the transistors inside radios, televisions and other everyday electronic items have transmitted data by controlling the movement of the charge of an electron. Scientists have since discovered that transistors that function by controlling an electron's spin instead of its charge would use less energy, generate less heat and operate at higher speeds. 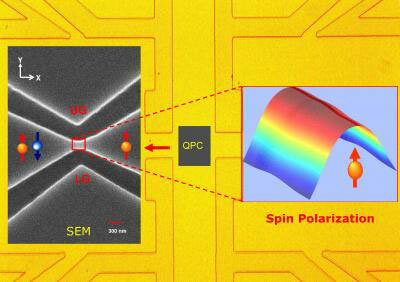 This has resulted in a new field of research — spin electronics or spintronics — that offers one of the most promising paradigms for the development of novel devices for use in the post-CMOS (complementary metal–oxide–semiconductor) era. Until now, scientists have attempted to develop spin transistors by incorporating local ferromagnets into device architectures. This results in significant design complexities, especially in view of the rising demand for smaller and smaller transistors," says Philippe Debray, research professor in the Department of Physics in the McMicken College of Arts & Sciences. "A far better and practical way to manipulate the orientation of an electron's spin would be by using purely electrical means, like the switching on and off of an electrical voltage. This will be spintronics without ferromagnetism or all-electric spintronics, the holy grail of semiconductor spintronics." The team of researchers led by Debray and Professor Marc Cahay (Department of Electrical and Computer Engineering) is the first to find an innovative and novel way to control an electron's spin orientation using purely electrical means. "We used a quantum point contact — a short quantum wire — made from the semiconductor indium arsenide to generate strongly spin-polarized current by tuning the potential confinement of the wire by bias voltages of the gates that create it," Debray says. Debray continues, "The key condition for the success of the experiment is that the potential confinement of the wire must be asymmetric — the transverse opposite edges of the quantum point contact must be asymmetrical. This was achieved by tuning the gate voltages. This asymmetry allows the electrons — thanks to relativistic effects — to interact with their surroundings via spin-orbit coupling and be polarized. The coupling triggers the spin polarization and the Coulomb electron–electron interaction enhances it." Controlling spin electronically has major implications for the future development of spin devices. The work by Debray's team is the first step. The next experimental step would be to achieve the same results at a higher temperature using a different material such as gallium arsenide.